Well, it's been a bit of a journey getting to this point... and I'm not even sure I can say that with a straight face, because I think what people think about my opinions around twenty-one pilots are very different than the actual reality, so I think it might help to bring folks up to speed. So, twenty-one pilots. They started off the late 2000s and very early 2010s with two independent albums that fans in the Clique adore a fair bit more than they deserve - not that there wasn't good ideas but both records are desperately unpolished, leaving twenty-one pilots as one of the few groups that actually got better through signing to Fueled By Ramen in the early 2010s. This led to them putting out their major label debut Vessel in 2013, a genre-blurring mess of an album that I still wound up considering pretty great because the compositions and songwriting contributed to sharp hooks, a keen sense of self-awareness, and a few genuinely brilliant tracks. In 2015 they followed it with Blurryface, delivered even more polished compositions and then ascended right up their own asses with a blistering self-aware dissection of their newfound fame... and it's also their best album to date and one of the best albums of 2015. And if it sounds like these comments are phrased to intentionally annoy the Clique... well, they are, but it's all in good fun and with the realization that I'm a pretty big fan of this group too - I'm just also very much aware of when a band starts taking the piss out of themselves - which may have been the entire damn arc of Blurryface, for the record. But I'll admit I was worried about Trench. Yes, the actual guitar on 'Jumpsuit' was exciting to me and the hope that this group was finally going to get some rock muscle was only encouraging... but I'll freely admit that there were warning signs about this project that made me wary. Because even going back two years later I did not like 'Heathens', and the less said about that butchering of My Chemical Romance's 'Cancer' the better, but both were signs that the band was starting to drown in their own veneer, and I wasn't sure a dystopian concept record was the way out of that, especially given that in my circles the hype seemed oddly muted. But hey, I still think this band is talented and having heard their blatant copycats and wannabes chase their fanbase, I was curious where they'd take their sound next, so what did we get with Trench? ...well, I'll say this: I don't know how twenty-one pilots convinced Fueled By Ramen to ship this, but I'm a little impressed they did, especially coming off of Blurryface where there had to be the expectation there'd be another crossover hit. 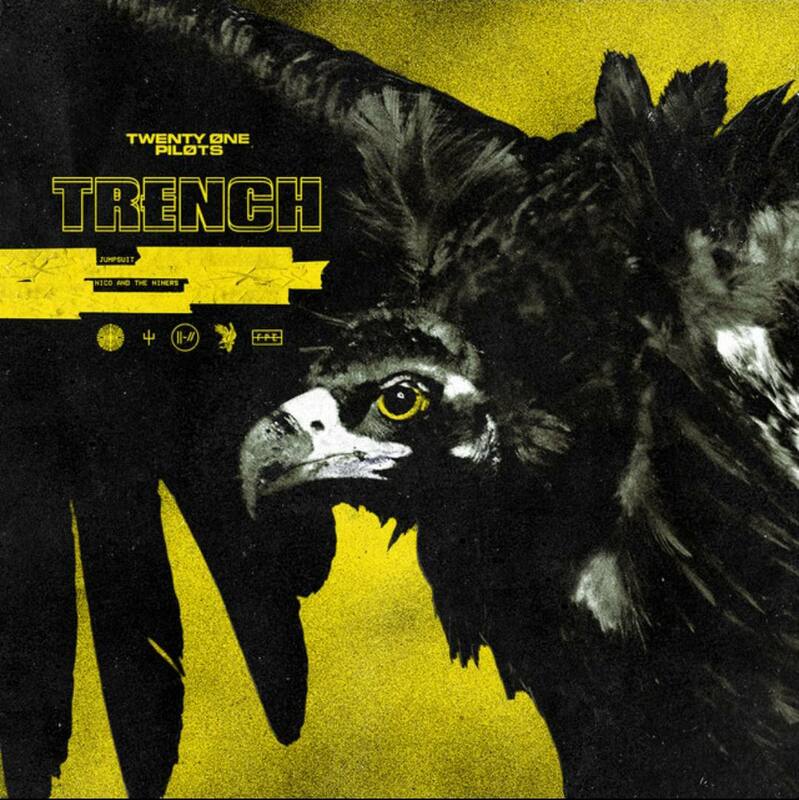 Because let's not get this twisted, Trench is a defiantly uncommercial move into a dreary, mist-saturated concept that feels like a hodgepodge of iconography - likely their most cohesive album to date in production, but in content it seems like their most scattered and murky. And thus reviewing this album will probably put me at odds with most of the Clique again, because I've been on record saying the duo's pop sensibility is arguably one of the greatest assets, and to mostly remove that from consideration makes you question if the writing and production can be enough to fill that void. For me, it wasn't, which means while I consider this good, it is not great or on the level of Vessel or Blurryface, and while I rarely bet on this material, I would put money on this not crossing over to a larger audience beyond the Clique... which has a sick sort of irony behind it, but we'll get to why when we talk about themes. Actually, let's start with that, given that there has been so much emphasis on Trench as a more ambitious, concept-driven album, with a website to sketch out story details, along with a string of cryptic names and concepts that seem drawn from a hodgepodge of myth and religion... well, in part. Yes, the 'Dema' seems to be a direct callback to the Dakhma in Zoroastrianism, an elevated tower where corpses are left exposed within as both fire and earth are sacred within that religion, but then you have references to bishops which are a very Christian church rank alongside the banditos that roam outside the Dema's impregnable walls. And the more important detail are the lights that the banditos and bishops carry: the banditos bring the reddish glow of real fire and all of its traditional life-giving-and-consuming iconography, but with the bishops they may have had a similar light before but now it's pale, yellowish and hollow, reminiscent of the purity that's come before but more sickly, intended to numb those beneath it. And the name of the bishops is important as well: 'Nico' is most prevalent, but it's short for Nicolas Bourbaki, which was the name of a sect of mathematicians within France in the 1930s who were attempting to ground all mathematics in set theory and consistent notation and who had a pseudo-spiritual focus on abstraction and rigor - the understanding of even the most abstract concepts binding the universe in consistent, rigid logic. Now that seems like a lot of detail for a concept album, especially when you come to a pair of distinct realizations. Firstly, Tyler Joseph revealed that the 'Nico' he named was representative of the 'blurryface' character described on the last album, a nebulous construct of insecurities about fame, artistic progression, and fandom - more on that in a bit. Secondly, and more interestingly, the concept behind the record is loose at best, as the duo doesn't hesitate to break character within the story and create songs focused on their real world people like Tyler Joseph's wife and his late grandfather on songs like 'Smithereens' and 'Legend'. Now normally this is the sort of thing that yanks me right out of a concept record... but given that the whole concept is more of an extended metaphor than a story being told gives twenty one pilots a bit more wiggle room, especially given how it once again circles around the band and their artistic development. And of course there's room for ambiguity and interpretation here, but given the subtext lurking beneath Blurryface, it's hard not to see the thematic throughlines grow even more stark - even if they come at the expense of their own fanbase. Because yes, while I've seen the interpretation that the escape from the Dema and the nine bishops is the primary metaphor for Tyler Joseph to put aside his insecurities and inner struggles, dig deeper and you realize that said bishops may not just represent those struggles but the people driving them at the core: namely, the music industry and even perhaps the more fanatical side of the Clique itself. Hey, think about it: the story told with the album describes how the Dema did represent a holy place for souls to ascend before - here symbolic of the art of previous records - but without any real fire anymore the entire Dema is bathed in the sickly yellow light of those seeking to duplicate and deaden the experience, especially those who believe it can merely be copied over and over. And note that the real world roots of the Dema is a mausoleum, which brings in the low-key centerpiece 'Neon Gravestones', which stands as a stunning rebuke of the glorification of suicide possibly amplified by deeper, depressive themes within their music - like with 'Heathens' two years ago, it's hard not to feel like Tyler Joseph isn't addressing his audience or at the very least not keenly aware of the overexposure that comes from a diehard fandom that would love everything to ossify and remain the same - hell, he even references them by name on 'Pet Cheetah' along with his very real fear. Now I know some will say that said bishops can't possibly represent even an element of the fandom - hell, 'Bandito' seems to imply on the second verse that some echo of the trust of those fans is helping him through, but also on that verse you get lines like 'like nicknames they give themselves to uninspire', and with references to the internet on 'Morph' it's easy to see a parallel to those who copypaste twenty one pilots blindly without encouragement of artistic growth. And more to the point, if you dig into the framing of said bishops especially on 'Leave This City', it's not angry or openly rebellious, but it almost seems sympathetic, grieving for those who must be left behind - why would the band show such sympathy to the labels or even insecurities on a record seeking to overcome and transcend them especially on 'Neon Gravestones', or realize they have to be put to the sword? Hell, I'd argue at the bishops seeking to decode the band's message and find that message as non-creators themselves being at least partially representative of overexposed fandom, and it adds real dramatic pathos to the struggle between levitating within the Dema in dulled stasis or becoming a bandito and slipping into the wild, leaving those who venerate them for all the right reasons behind. And you know, there's a part of me that honestly wishes the band was a bit more committed to doubling down on the abstraction of the story instead of sliding in awkward non sequiteurs like naming the pet cheetah 'Jason Statham' on 'Pet Cheetah'... and this is where we get into the actual execution of this album, where despite some thematic richness I'd argue it doesn't quite realize its potential. Part of this is tone: yes, I get why this album indulges in dour, heavy-handed reverb, echoing across increasingly barren mixes that don't have the same pop focus of Blurryface, the Dema is an open-air graveyard hemmed on all sides and bathed in unearthly fluorescence, it's a bleak listen by design. But I did say that twenty-one pilots could start to drown in its own veneer at the cost of its stronger pop sentiments, and Trench is the most stark indictment of this. Yes, the guitar crunch behind the opener 'Jumpsuit' has a ton of promise, but it's easily the heaviest track here and one of the few with any sense of momentum or visceral presence. Part of this is Tyler Joseph's choice to rely more heavily on falsetto instead of his more strident midrange - it's what doesn't click for me on the otherwise pretty damn good groove 'In My Blood', it just doesn't have the presence to hold against such thick production. But then there are songs that have a decent prechorus build that even if they're to build to a drop they just meander into tones and progressions that don't add to more of a hook, like 'Morph' with all of its horn embellishments or the wonky ukulele passages around the two hooks mashed together on 'Nico And The Niners' or the odd lack of climax on 'Leave The City' despite a lot of build-up. Or you get songs like 'Chlorine', 'Bandito' and 'Cut My Lip' which have hooks and basslines but still feels smothered in distant smoky texture that's listenable, but feel weirdly inert, or moments of isolated but muted brightness like 'Smithereens' and 'Legends', which are reminiscent of Vessel and only feel more out of place especially given how their subject matter doesn't connect with the concept. The truth is that for as melancholy and dour as this album feels, there are only a few songs that can pay that off effectively like 'Neon Gravestones', and even that song seems to lose focus in a blur of piano-driven drums and haze - and on the flip side, one of my favourite songs on the album is 'The Hype', because despite the blatant late-90s throwback of its composition, if only because it's got some of that pop sparkle with its hook! So look, at the end of the day, I don't think this is a bad album by any stretch, but at this point I have to question whether twenty-one pilots will follow their own mandate and move away from the smoky, introspective melancholy that built their fanbase, especially as I thought a lot of that character growth and development was completed off of Blurryface, and it's hard not to feel like Trench is a more conceptual but also more dreary and wearisome repeat of a similar arc. And it's hard to ignore the very real problems here: the hooks are not as tight, the songs feel more ponderous, and say what you will about the on-the-nose lyrical sentiments of Blurryface, they felt more distinct and carried more personality, when it's not like there's any shortage of this brand of smoky, reverb-saturated atmospheric pop rock with hip-hop elements being made right now for twenty-one pilots to fit in. And as such, for me it's a solid 7/10 - there are some choice cuts, but it doesn't feel as novel or distinct, and while the fans will adore it, as soon as some realize there are themes set at their expense I can see this not being as revered as earlier releases. That said, it does open intriguing avenues for twenty-one pilots going forward, so we'll see where this goes.